The Best Chatbot Blogs from thousands of Chatbot blogs in our index using search and social metrics. We’ve carefully selected these websites because they are actively working to educate, inspire, and empower their readers with frequent updates and high-quality information. Chatbot newsletter is a comprehensive summary of the day's most important blog posts and news articles from the best Chatbot websites on the web, and delivered to your email inbox each morning. To subscribe, simply provide us with your email address. Ottawa, Canada About Blog Bot Libre is a free open platform for bots and artificial intelligence for the web, mobile, and social media. San Francisco, CA About Blog Chatfuel is a leading platform for making bots on Messenger. Find news, tips and information related to chatbots from this blog. Facebook fans 15,755. Twitter followers 4,683. San Francisco, CA About Blog Reddit is a community of millions of users engaging in the creation of content and the sharing of conversation across tens of thousands of topics. Find information related to chatbots on popular messaging platforms like Facebook Messenger, Slack, SMS, WeChat, or Kik. Also discuss AI, NLP, and Machine Learning. Facebook fans 1,186,736. Twitter followers 553,934. San Francisco, CA About Blog Learn how designers and developers are shifting toward conversational interfaces. Find Tutorials, interviews and stories from this blog. Facebook fans 613. Twitter followers 301. Cambridge, MA About Blog Growthbot is a sales and marketing chatbot from where you can get all your answers. This blog gives information about the same. Facebook fans 15,068. Twitter followers 10,957. Malta, Belgium About Blog Discover everything you need to know about chatbots, AI and intelligent conversation design from this blog. Connecticut, USA About Blog Find information about friendly bot from this blog as it helps in Insurance Industry, serve customers and grow your business exponentially. About Blog This blog has tips as how to create chatbot and use it via Facebook Messenger. Facebook fans 1,243. Twitter followers n/a. About Blog Find out our latest NLU, UX, DevOps and business news on our blog. We focus on understanding users’ inputs to help you build intelligent dialog based apps. Facebook fans 50,002. Twitter followers 5,348. Boston, MA About Blog Mobile Monkey is a platform for Marketers to create, manage and promote their brands with AI Chatbots, one of the most exciting and disruptive new Marketing technologies today. We believe the personalized IA is future of Digital Marketing and we are partnering with the best Marketers and Digital Agencies on the planet. Facebook fans 348. Twitter followers 1,738. Norwich, England About Blog Learn all about chatbots, conversational commerce, and artificial intelligence through industry-leading content. Facebook fans 169. Twitter followers 2,162. About Blog Tips and tactics to help you build your engaging chatbots without coding. Find case studies, Messenger marketing and much more. Orlando, FL About Blog Kore.ai is an enterprise software provider of an all-in-one Chatbots Platform (as-a-service) and cutting-edge smart technology for enterprises to build and deploy out-of-the-box or completely customized chatbots for their customers and workforce. Facebook fans 7,833. Twitter followers 4,290. Bengaluru, India About Blog Engati is one of the best free chatbot platform to build bots in minutes without programming. Build once and publish across 8 major platforms - FB messenger, kik, telegram, line, viber, skype, slack and website. This blog gives information about the same. Facebook fans 2,103. Twitter followers 614. San Francisco, CA About Blog Botanalytics is a conversational analytics tool for bots. It helps bot makers to improve human-to-bot communication by identifying bottlenecks, segmenting conversations & users, and measuring engagement. Facebook fans 438. Twitter followers 1,488. About Blog Snaps helps brands like Nike, Marriott, VICE & more acquire new customers, increase LTV and remove customer service costs using automated chat. This blog tells about brand marketing using chatbots. Facebook fans 5,376. Twitter followers n/a. About Blog At Pragnakalp, we are developing cutting-edge solutions using latest tech. Machine Learning, Natural Language Processing (NLP), Chatbots and Python development. Facebook fans 2. Twitter followers 3. United States About Blog Living Actor is a company specialized in chatbots, Virtual Assistants and 3D avatar technologies. It gives information about the same in this blog. Facebook fans 78. Twitter followers 463. San Francisco, CA About Blog Recime is an enterprise chatbot platform. Find Product announcements, feature updates, tips, and technical posts on chatbot creation. Facebook fans 255. Twitter followers 183. London, England and Lviv, Ukraine. About Blog BotsCrew is the global leader in Chatbots Development with offices located in London, England and Lviv, Ukraine. This blog talks about its development and its application in various field. Facebook fans 458. Twitter followers 141. United Kingdom About Blog Botgento is a SAAS platform which can integrate E-commerce store or Shopping website with the Facebook page to communicate with customers in fb messenger. Facebook fans 1,092. Twitter followers 128. About Blog Tangowork lets you send communications where you know your staff will see them in their messaging app. You can ask the chatbot questions about company stuff using regular language, and it answers back. This blog gives the details about the same. Facebook fans 41. Twitter followers 458. Germany About Blog We are specialized in the development and design of Conversational Interfaces. Our focus is the programming of chatbots on multiple platforms such as Facebook Messenger, Skype, websites, etc. London, England About Blog With Chatamo you can create bots for free for intelligent voice and chat bots for marketing, sales and support in minutes. This blog gives information about the same. Facebook fans 10. Twitter followers 338. Aylesbury, England About Blog Welcom to our team blog. The BOT Forge are UK based chatbot developers and AI specialists. We design, build and develop intelligent chatbots. Discover chatbot best practices, ideas and AI related news by the BOT Forge team! 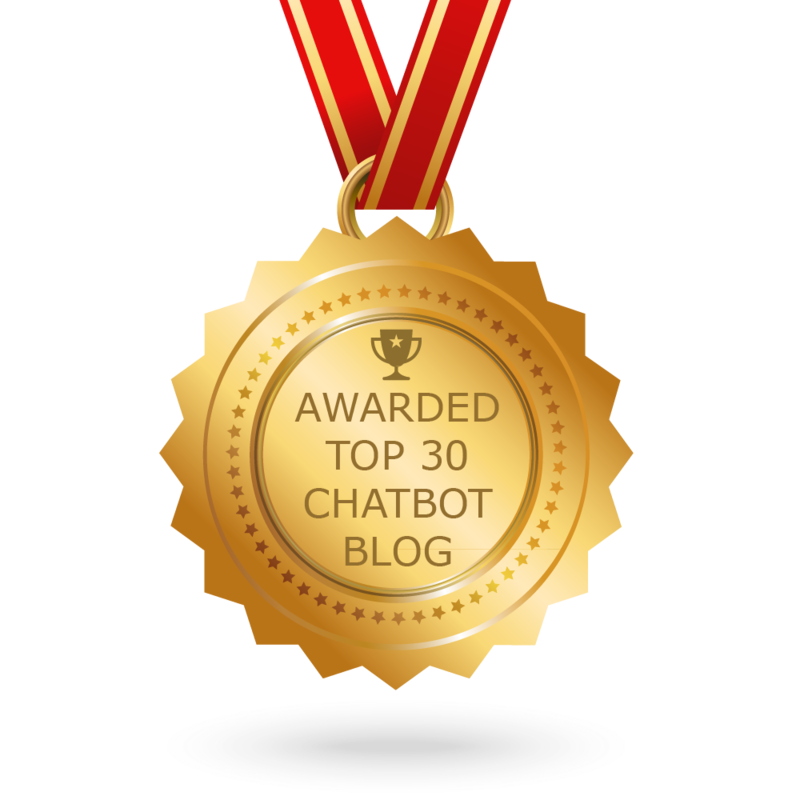 CONGRATULATIONS to every blogger that has made this Top Chatbot Blogs list! This is the most comprehensive list of best Chatbot blogs on the internet and I’m honoured to have you as part of this! I personally give you a high-five and want to thank you for your contribution to this world.